Admittedly, there was a time when I had no desire to get involved with “plywood” guitars...I had spent the bulk of my years in this business carving, and using only solid wood in my work. I was given to the erroneous thought that “plywood” meant “cheap”. I was wrong. While laminated plates are less expensive, they are also much more stable during climatic changes. They are less likely to swell and recede with changes in temperature and humidity, and less likely to suffer the cracks and structural damage that can sometimes happen in fully carved instruments. 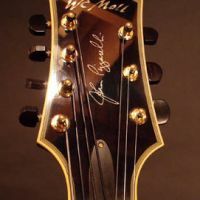 For the player, this means that the guitar requires less frequent adjustment, and is less likely to suffer catastrophic damage from the elements, or from hard work, night after night, after night. The tricky part, it seemed, would be to make them respond, and sound good acoustically, as well as electrically. 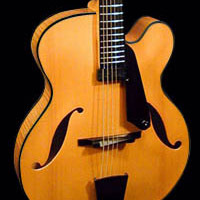 Well today, we’re told that we may just have the best sounding laminated instrument available. In fact, numerous players - even other builders - have been amazed to learn that the guitar we handed them to try out was... “plywood”. We’d love the opportunity to amaze you too.